The Boulder Poetry Tribe was founded in 2013 by Jonathan Montgomery as an online forum to share scheduling for poetry events in the Boulder area. The Boulder Poetry Tribe website is the repository of local artist profiles, pre-event promotional articles, and op/ed articles on poetry and topics surrounding the subject. The BPT Facebook page is the clearinghouse for notification of local poetry and performance art events and other timely postings. The powerful MeToo! philosophy of the Tribe is highly infectious. This website hosts the homepages of Beyond Academia LLC, the Beyond Academia Free Skool, and Boar Hog Press. Course descriptions and instructor profiles are the heart of the BAFS website, while the Boar Hog Press pages allow free online viewing of the Love Shovel Review and some of the chapbooks. The Beyond Academia Free Skool has finally found a stable home with our sister organization the Boulder Writers Warehouse, located at 2500 47th Street in Boulder. Founded and Directed by Ellie Swensson, the BWW is part of the non-profit Boulder Creative Collective, which also hosts numerous visual artists. The BWW mission is to provide a meeting and teaching space for writers in Boulder, as well as physical resources such as internet and printing facilities. The Ranch has provided a bit of high-altitude sanctuary for artists, musicians and writers for the past 25 years. 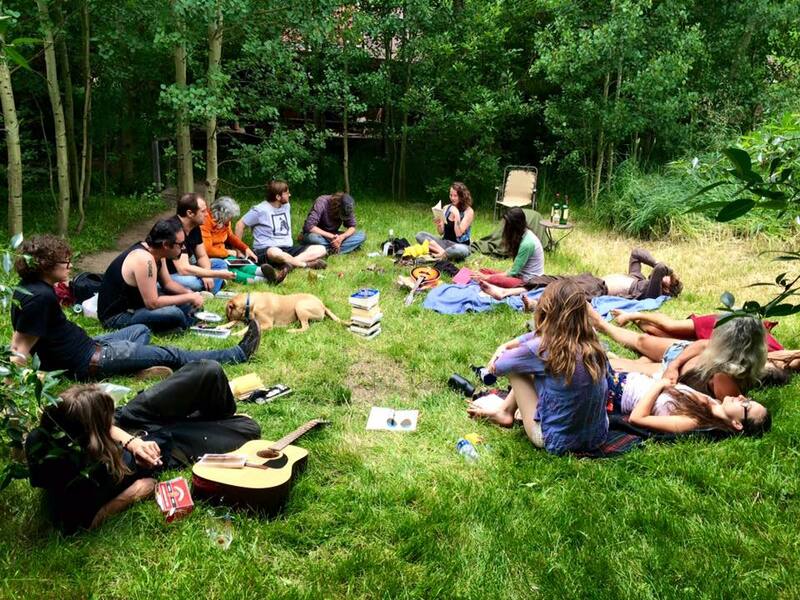 During July the BAFS Summer Poetry Camp workshops are held here outside in a grove of aspens, weather permitting. Love Shovel Ranch is the home of Beyond Academia LLC Chairman Marcus If. Bouldering Poets is a monthly Reading series held at rotating venues in the City of Boulder. This series showcases the work of two writers and one singer-songwriter from the Boulder area each month. Founded in 2013 by Elyse Brownell and Chris Shugrue, the series is currently curated by Caroline Swanson. It is one of the goals of Beyond Academia LLC to provide compensation to the features performing in this or a similar reading series. One of the first readings of its kind in the world, the Fbomb was founded in 2012 by its host and Beyond Academia Board member Nancy Stohlman. Flash fiction writers from the Front Range and all over America feature at this nationally acclaimed monthly reading. The Fbomb is in the process of franchising to four other American cities. The current home of the original Fbomb series is at the Mercury Cafe in Denver, Colorado. Readings are on the third Thursday of every month. At the request of the Frozen Dead Guy Days festival in Nederland, Colorado, the Beyond Academia team hosts the Annual Frozen Dead Poet Slam. FDPS is a light-hearted competition held in the middle of First Street in Nederland on a small, portable stage. Participants gather in costume and character to read the work of famous dead poets right in the middle of the street crowd. No microphone is provided. FDPS began in 2015, and has been hosted by Khalil Gibran, Gaius Valerius Catullus, and Walt Whitman. Organizational duties are performed by Marcus If. Beyond Academia was born out of the local Boulder poetry scene, and the instructors and staff maintain a strong presence at the local weekly open readings, notably the So, You’re A Poet series at the Laughing Goat Cafe and the Innisfree Reading at the Innisfree Poetry Bookstore & Cafe. Most often there will be three or more Beyond Academia readers in the crowd, including both instructors and students. Beyond Academia’s community participation is in stark contrast to the academic writing departments at CU and Naropa, both of which are insular communities rarely found at public readings. Founded in 1993 by John Wright and Marcus If, Boar Hog Press aims to provide exposure to underpublished writers on the Colorado Front Range. Publication is by solicitation only. To date the Press has published nine chapbooks, seven literary journals (the Love Shovel Review), and one anthology. Thomas Ivory Jr. is the current Acting Editor. It is one of the primary goals of the Free Skool to provide opportunities for fledgling teachers to exercise their skills. To that end we encourage local writers to develop a workshop in order to generate some experience. Seasoned instructors mentor this process. We believe that teaching a subject gives the instructor deeper insights into their own art, and disseminates their knowledge into the community. BAFS also makes an effort to provide free workshops from notable writers who might normally charge a fee. Boulder, Colorado has a plethora of street musicians and buskers who perform on Pearl Street Mall and other public locations, but the presence of poets is somewhat lacking. Poets on Pearl is a program designed to increase the poetic footprint by hosting a paid poet duo to read community-appropriate family-friendly verse on the Mall on Saturday afternoons from May through September. Sharing famous known poems as well as children’s poetry in a public ‘street’ format would allow poets to engage the greater community on a visceral, more meaningful level. Poets hired for this prestigious position will be vetted by the Beyond Academia Board of Directors and will read from a Board approved canon to ensure maximum public receptivity. It is the steadfast assertion of Beyond Academia that teaching poetics to youth is of primary import in the development of their communication and problem solving skills. Additionally, the self-esteem generated by the creative process is invaluable in a world of mass-marketed identity. We hope our proposed youth programs will address these concerns. They include Playground Poetry, encouraging toddlers & pre-teens to “play with words” in the comfort of their own playground environment, Elementary Poetry for Elementary Skoolkids, which brings BAFS guest workshops into local public and private schools,Young Adult Word Jams for teenage writers during and after school, and the increasingly important At-Risk Youth Therapeutic Writing Program. These programs are in development by our highly experienced Early Childhood instructors June Lucarotti, Rachel Ann Harding, and Cicada Musselman. Beyond Academia believes that bringing the arts to marginalized communities is healthy for the greater community as a whole. We therefor propose the development of programs to target (at minimum) the following communities: Military Veterans, Seniors, Disabled People, Inmates at the Boulder County Jail, AA/NA groups, and the GLBTQ community. Beyond Academia believes that education in the future will move away from the academies and split into two forms. The first, currently addressed by the Free Skool, is direct mentorship with experts in the field. The second will be virtual education available free over the internet. Many prominent universities already offer free online courses. BAFS proposes to publish its proprietary lectures and teaching styles in the form of free online lectures where appropriate.